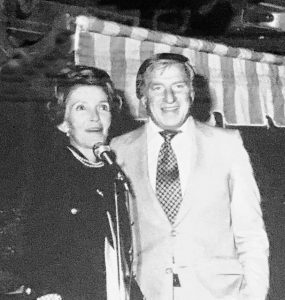 First Lady, Nancy Reagan and Seymour Holtzman at the Holtzman residence. WILKES-BARRE – The country lost a former first lady Sunday while Seymour and Evelyn Holtzman lost a close friend. The Holtzmans recalled their friendship with Nancy Reagan, who died Sunday at the age of 94. The Holtzmans visited the Reagans often – in Washington, D.C., and in California at the Reagan ranch. When President Reagan returned to the White House following the 1980 assassination attempt, Seymour said he and his wife were two of just 10 people gathered in the Rose Garden to welcome him home. The Holtzmans have several photos of their times with the Reagans’ at state dinners at the White House, on horseback and even in the Holtzman’s backyard in Kingston. The Holtzmans have a picture of that event signed by the former first lady. The Holtzmans also attended a controversial 1982 dinner at the White House that featured Egyptian President Hosni Mubarak. The Holtzmans said it was the first state dinner that Nancy Reagan had. “We were invited and we have a picture of my wife shaking hands with Nancy and Egyptian First Lady Suzanne Mubarak of Egypt. The dinner featured new White House china that was termed “extravagant”. The controversy subsided when it was revealed that the cost of the dinnerware was covered by a private donation. And then there was the time that President Reagan and Nancy invited the Holtzmans to an event at the Kennedy Center. The Reagans were unable to attend, so the Holtzmans sat in the president’s box. The Holtzmans said their son, Marc, is now working in Hong Kong. When Reagan ran for the presidency in 1979, Marc was named campaign director for Pennsylvania.